Any social network allows its users the opportunity to construct a favorable simulacrum of themselves on the fly, choosing the images, quotes, tastes, and even personality that they want. But Tinder’s single-minded focus on hooking up draws these qualities out even more, showing as much about each user’s insecurities as it does what they’re most proud of. Even moreso than LinkedIn, it is a place where you clearly can see someone’s aspirations—and, accordingly, their fears. And so what can be said of Jesus here? There are only a couple of options. 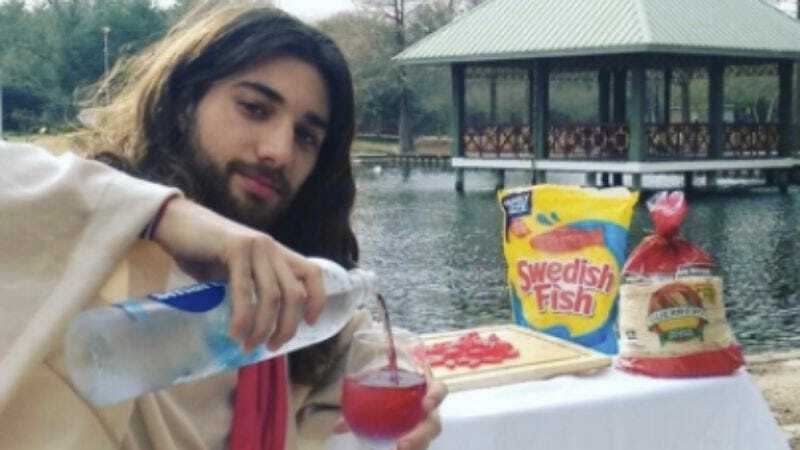 This is either someone who quietly aspires to be Christ; it is someone who is trying to stand out from the Tinder pack through this peacockish display of sacrilege; or it is actually Jesus Of Nazareth, the Judeo-Christian deity made flesh, here to score some tail. Look, this is probably just a guy sitting around writing cheesy pickup lines in character as Jesus. (Popdust has many more of them, although their provenance is dubious.) This is a fine enough hobby, and its popularity has inspired many more “Tinder Jesus” accounts that are making the rounds. Tinder has said that they maintain secret internal ratings of each user’s desirability, and when a system is introduced it is only a matter of time before someone tries to game it aggressively. It is only appropriate that the endgame here was either a man cosplaying as Jesus or the lord returning to Earth as foretold in the Bible and finding himself tempted by endless, consequence-free flirting.